A multiple Specialty Winner, this lovely daughter of Bentbrook's Blue Chip and Am. Ch Bentbrook's Talk of the Town finished with 3 Major Wins. 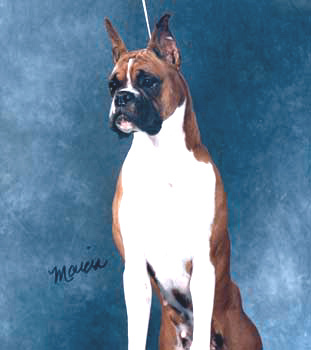 In 1994 Sophie was a 1st place Winner in the 1994 American Boxer Club Regionals (12-18) followed by another 1st place Regional win , Oregon Boxer Club. Two weeks later she received "back to back" Major wins with the first Major and Best of Winners at Golden Gate Boxer Club .The next day Sophie was awarded another Major at the prestigious Del Monte Kennel Club competition winning BOW . Her 3rd Major was a 5 point Major at the Ohio Boxer Club. 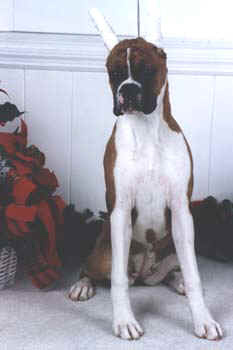 At the American Boxer Club Nationals in 1995 she was a winner in the competitive Open Fawn class.